I loved that game… especially playing as Robin Givens in the last round. where can i purchase this gem of a poster? You might have to ask for a custom-made job… I wanted to buy a poster of one of his pieces but he didn’t sell them due to certain copyright issues he didn’t wanna get tangled in. If it’s worth the money to you, email the guy and ask. 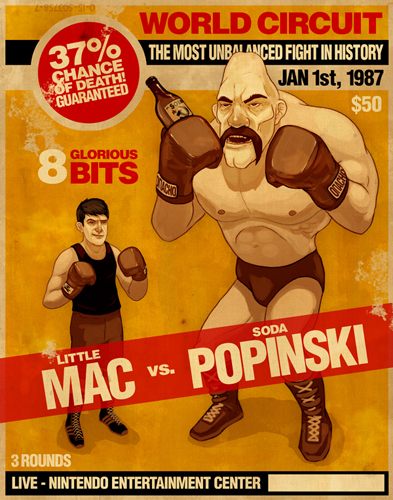 I have nothing but hate for Popinski. It looks like a Circuit City ad. how do you guarantee a chance of death? @LukeV1-5: @ColombianMonkey: Not just 8 bits, 8 glorious bits. @nyokki: my bad, ofcourse it’s 8 glorious bits. anyone who wants posters of ANYTHING they find on the internet, look into rasterbating. no… seriously. google it. they make programs that make it really easy and you can make posters or wall-size murals of anything for very cheap.